A coating of carbon nanotubes, seen through a clear jacket, replaces a braided metal outer conductor in an otherwise standard coaxial data cable. Photo: Jeff Fitlow/Rice University. Common coaxial cables could be made 50% lighter with a new carbon nanotube-based outer conductor developed by Rice University scientists. The Rice lab of Matteo Pasquali has developed a coating that could replace the tin-coated copper braid currently used to transmit the electrical signal and shield the cable from electromagnetic interference. The metal braid is the heaviest component in modern coaxial data cables. This research appears in a paper in ACS Applied Materials and Interfaces. Replacing the outer conductor with Rice's flexible, high-performance coating would benefit airplanes and spacecraft, where the weight and strength of data-carrying cables can significantly affect performance. Rice research scientist Francesca Mirri, lead author of the paper, made three versions of the new cable, by varying the carbon nanotube thickness of the coating. She found that the thickest coating – about 90µm thick, approximately the width of the average human hair – met military-grade standards for shielding and was also the most robust; it could withstand 10,000 bending cycles without any detrimental effects on cable performance. "Current coaxial cables have to use a thick metal braid to meet the mechanical requirements and appropriate conductance," Mirri said. "Our cable meets military standards, but we're able to supply the strength and flexibility without the bulk." Coaxial cables consist of four elements: a conductive copper core; an electrically-insulating polymer sheath; an outer conductor; and a polymer jacket. The Rice lab replaced just the outer conductor, coating the sheathed cores with a solution of carbon nanotubes in chlorosulfonic acid. 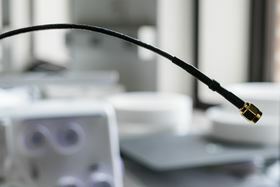 Compared with earlier attempts to use carbon nanotubes in cables, this method yields a more uniform conductor and has higher throughput, Pasquali said. "This is one of the few cases where you can have your cake and eat it, too," he said. "We obtained better processing and improved performance." Replacing the braided metal conductor with the nanotube coating eliminated 97% of the component's mass, Mirri said. She added that the lab is now working on a method to scale up production, drawing on its experience in producing high-performance nanotube-based fibers. "It's a very similar process," Mirri said. "We just need to substitute the exit of the fiber extrusion setup with a wire-coating die. These are high-throughput processes currently used in the polymer industry to make a lot of commercial products. The Air Force seems very interested in this technology, and we are currently working on a Small Business Innovation Research project with the Air Force Research Laboratory to see how far we can take it." A scientist from South Korea has reportedly developed technology for reinforcing metal matrix composites with carbon nanotubes.